When the dog days of summer arrive, do you notice a few unwanted pounds are upon you? This really should come as no surprise. After all, we kick-off the summer with Memorial Day cookouts and from that time forth, we tend to eat and drink our way through June, July, and August. The next thing we know, we’re pulling on our favorite shorts and saying to ourselves, “Now I KNOW these weren’t this tight a month ago!” Still, there are so many beach days, pool parties, outdoor concerts, food festivals, and amusement park visits yet to come, each with it’s own food and drink temptations that we’re not quite ready to give up. So how do we successfully navigate these last few months of summer without causing too much damage to our waistlines? Here are 5 tricks you can use to help keep your eating in check so you don’t spend the entire fall and winter months reversing too much summer food fun. It’s no secret that hamburgers, hot dogs, and chicken legs are the staple grilling meats at summer cookouts and get-togethers. Unfortunately, these are all high-fat foods and eaten in excess, they can do a number on your waistline! One sure-fire way to avoid eating these unhealthful options is for you to bring your own lean meat to the event. I typically bring my uncooked marinated chicken breast or shrimp and veggie kebabs with me in a small cooler, and then ask the host to grill my protein along with the other fare. This is one guaranteed way for you to know that you are getting a quality, low-fat protein source that won’t end up on your hips! I have yet to attend a cookout where a tempting dessert table wasn’t present. And as a self-professed “sweet tooth,” it’s not easy to sashay my way around it… and I typically won’t. I am, however, going to do two things in order to make sure I am not tempted to overindulge. First, I am going to fill up on a healthy meal of lean meat, a good amount of vegetables, and the most healthful starch option I can find. Since I have satisfied my initial hunger with healthy foods, by the time I hit the dessert table, I am not tempted to pull a chair up to the table and eat to my heart’s content. When I do get to the dessert table, I only try out the sweets I know I wouldn’t be able to get anywhere else. This means I avoid the pre-packaged, processed sweets, but allow myself to enjoy the homemade items. This decision in itself often helps me avoid overindulging as not many people bring homemade dessert items to the cookouts I attend. If there are a lot of homemade items, I always ask what the dishes are so I can decide if it’s something I’d even enjoy. Once I’ve narrowed my choices down, I take a small sample of each dessert. This strategy typically gives me enough to satisfy my sweet tooth. If you’re really trying to be good, however, then avoid the dessert table altogether and nosh off of the fruit tray that is a staple item at most cookouts. Many of us tend to be social drinkers and as such, summer get-togethers are prime territories for over-indulging in alcoholic consumption. Too much alcohol, however, is a sure-fire way to pack on the pounds. How does alcohol do this? Keith Klein, CN, CCN explains this best by describing how alcohol works as a drug and as a food. (1) Like a drug, alcohol absorbs immediately through the stomach wall and pours into the bloodstream. It acts as a food because it supplies the body with energy that can be used and used immediately. And yes! Alcohol is calorically dense, yielding 7 calories per gram. So here’s the issue: I don’t know about you, but when I’m drinking a glass of wine, I’m not swimming laps or doing sprints! I’m sitting with my friends and enjoying great conversation and good food! Since the body registers alcohol as a toxin, it will metabolize it before anything else. This has two consequences: first, fat utilization can be reduced by as much as 75% after only 1½ drinks. (2) Second, any fat or carbohydrate you consume has a higher propensity to be stored as fat since your body is too busy processing the alcohol. If you are determined to drink in spite of this information, my advice is this: give yourself a smaller pour, and pour it into a smaller glass in order to lend to the illusion you are still drinking a full serving. 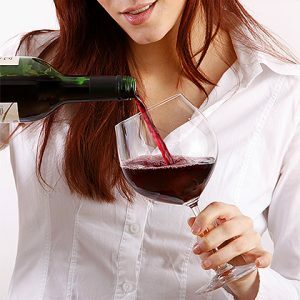 For example, if you are used to an 8 ounce pour of wine, limit it to 4 ounces and put it in a smaller wine glass. Once the drink is finished, consume at least 8 ounces of water. This not only helps with re-hydration (alcohol dehydrates you), it will also give you a moment to think whether you really want another drink. If not, great! If so, simply drink the other half of your typical serving. This way, you’ve had two drinks but really, you’ve had only one of what you’d normally consume! You’ve been there: you’re sitting with your friends talking and having a good time, picking at the basket of chips in front of you. The next thing you know, your hand dives in for another chip but your fingers only meet air. Without realizing it, you just ate the entire basket of chips! What you just did is known as mindless eating, a term coined by Brian Wansink, PhD, a food psychologist at Cornell University. 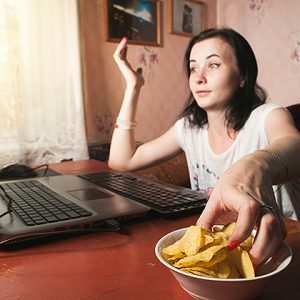 Mindless eating is the habit of eating based on outside cues such as social environment, container sizes, and distractions, as opposed to eating based on genuine hunger cues. (3) If you fall into the mindless eating trap, you are bound to overshoot your daily caloric needs. And as most mindless eating involves noshing on high fat foods such as chips, cheese, nuts, and bite-sized meat products, you’re more than likely overshooting the 20-30% of total calories coming from fat as recommended by the RDA. (4) The solution? Eat mindfully! For example, I make the conscious decision to not socialize around the snack table. Why? Because when I do this, I suddenly lose control of my hand and it keeps diving in to one of the many filled-to-the-brim treat bowls present. Therefore, I opt to put a handful of one or two items that look good to me on a plate and then I move on to another room or outside, depending on where the event is. This is beneficial in two ways: first, I am able to control the amount I eat. Second, since it’s highly likely I’ve made myself very comfortable wherever it was I chose to migrate to, I have to think about whether it’s worth the effort to get up and get more. Plus, I have a moment to decide if I’m even hungry for more. 5) Stay True to YOU! 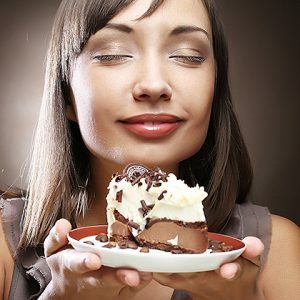 When we’re surrounded by good eats and good drinks, it’s hard not to succumb to our friends’ requests to have “just one drink” or to try “just a little piece.” However, it’s important to remember that if you have a goal, whether its weight loss, contest prep, or simply living a healthier lifestyle, some eating and drinking habits can slow down or inhibit your ability to reach that goal. Therefore, it’s very important to understand only you are in control of you and of what you do. I hear it all the time, “But they made me eat it!” or, “They forced me to drink just one with them!” Understand that no one makes you do anything; rather, you choose to do what is being suggested to you. I’m not saying I never drink or that I never have a treat. However, since my goal is to maintain my healthy lifestyle (which I love) and maintain a relatively lean physique, when I do have a glass of wine or when I do eat a dessert, the timing is carefully orchestrated by me. I choose when to have these treats and I don’t let others pressure me into eating or drinking when I don’t want to. I’m not being a food snob, nor do I think I’m better than someone else simply because I’m choosing to by-pass something that is not staple in my diet. Rather, I am being true to what I personally believe in regarding nutrition and how I should fuel my body. By sticking to my nutritional mantra, I am better able to cope with situations in which food temptations are everywhere. Elizabeth Anastasopoulos, a NASM Certified Personal Trainer and Fitness Nutrition Specialist, spends significant time in the gym training her athletes. However, her time as a figure competitor in the OCB directed her passion towards nutrition and nutritional counseling. She is currently pursuing her Diploma in Comprehensive Nutrition, and she plans to continue her education by obtaining a certification in sports nutrition as well. Her greatest joy, though, is her family. She is a proud wife, as well as the mother of an 18 year-old daughter and of 9-year old twins. As a family, they enjoy multiple outdoor activities and traveling to various destinations. 1) Klein, Keith, CN, CCN. “Sugars, alcohol, and processed carbohydrates.” The Shift. CD.